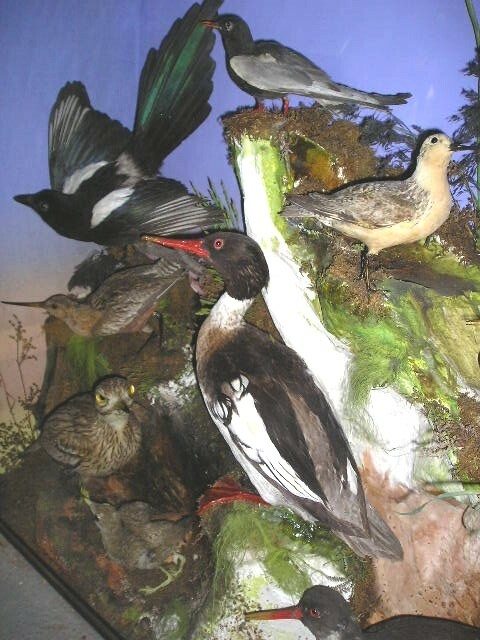 Given the nature and scale of man's obsession with collecting both Victorian and modern taxidermy, we have had to dedicate an additional page to add some more cases for your perusal. Once again we hope that you enjoy them. 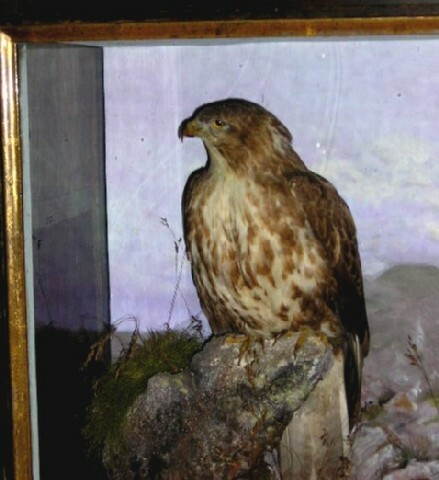 The web page below has a written narative explaining collecting and also contained within this page are some additional taxidermy pictures of cases within one collection. Again it represent around 100 cases, which when combined with the web page below illustrates only 30% of the total cases within this collection. The following pictures still only relate to one collection, The Four Elms Collection. 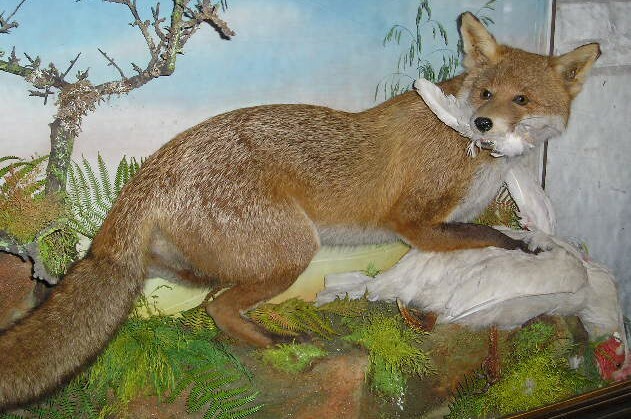 Arguably this is one of the largest and most comprehensive taxidermy collections in private hands in England. Many of the Victorian and Modern Taxidermists of merit are represented here. Victorian of Kestrels and chicks by McCley of Inverness. Closeup of Victorian of Kestrels and chicks by McCley of Inverness. Victorian Black Headed Gull by James Hutchngs. 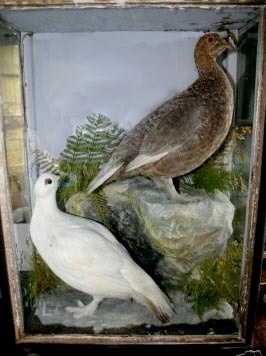 Victorian Ptarmigan by James Hutchings. European Tawny Owl by Roberts of Norwich. 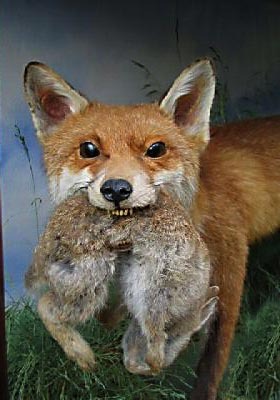 Red Fox with Rabbit prey, lovely face detail . Charming Red Squirrel with very subtle watercolour background by Peter Spicer of Leamington Spa. Spur Winged Plover by Peter Spicer of Leamington Spa. Rudd by John Cooper & Sons of London. Common Buzzard by Peter Spicer of Leamington Spa. Pied Blackbird by Rowland Ward. 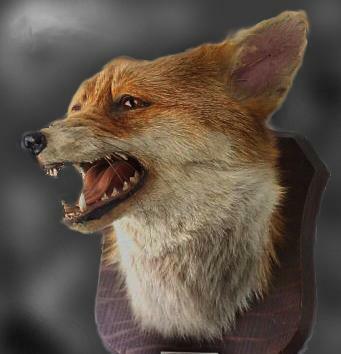 Fox mask by Jack Fishwick. Female Red Crested Pochard, by Saunders of Great Yarmouth. 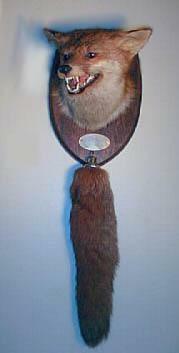 Victorian Fox mask by Peter Spicer, one of about 75 this collector has!. European Badger in ambush upon an Albino Mole by James Hutchings. 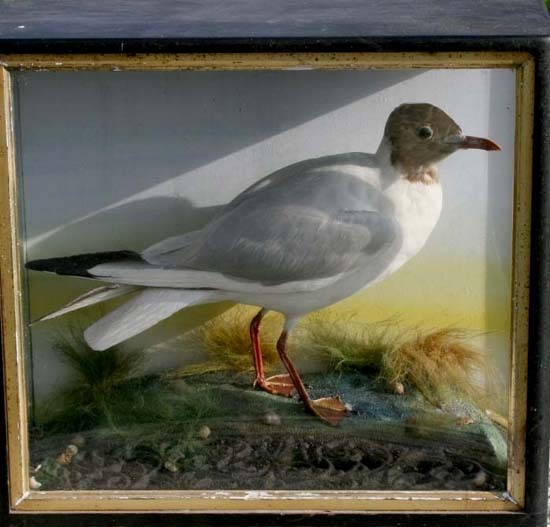 European Pochard, by unkown Victorian taxidermist. Victorian Shellducks by Henry Shaw. 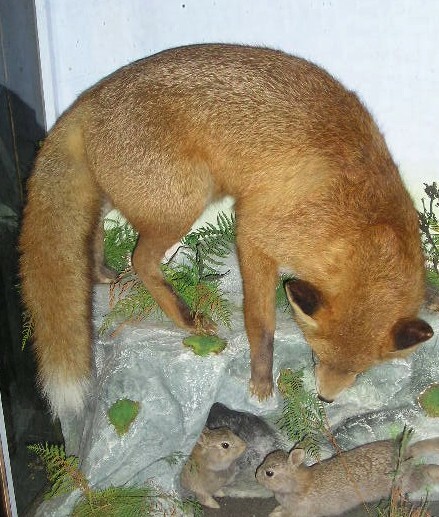 Red Fox with Rabbits in ambush by James Hutchings. Female Shovelor duck by Williams of Dublin. Peregrine Falcon with Pigeon prey by Jefferies of Camarthen. Red Fox and Golden Plover prey by Hutchings. European Red Fox by Ecutt of Newport, in South Wales. 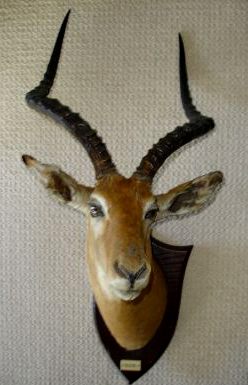 African Impala head by Peter Spier, excellent example. Male Shovelor duck by Rowland Ward. European Red Fox with Grey Partridge by James Hutchings. European Red Squirrel by Peter Spicer of Leamington Spa. Complete with signed pebble in the front left corner of the case. Badger by Barry Williams in the style of James Hutchings. Red Fox and Teal prey by Hutchings. Female Marsh Harrier by Williams of Dublin. Red Squirrel and Buzzard with Rabbit prey by Jefferies of Camarthen. Polecats with Rabbit prey by Hutchings. Polecats with Starling prey by Hutchings. Polecat with Skylark prey by Hutchings. Black Winged Stilts by James Hutchings. 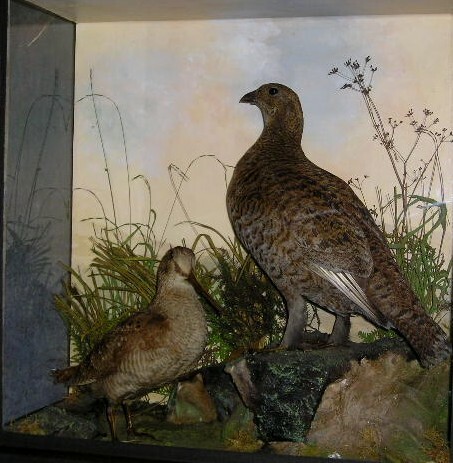 Ptarmigan from the Clungunford Collection. Recased and restored by Barry Williams of Cannock. European Red Fox ambushing a Polecat with Rabbit prey by James Hutchings. Close up of European Cormorant by Hutchings. This bird is contained within a much larger case. European Heron by Peter Spicer of Leamington Spa. Fabulous watercolour background depicting Mallards in flight. Polecat with Red Squirrel by Jefferies of Camarthen. Pair of Common Buzzards and Rabbit prey by Jefferies of Camarthen. European Magpie by Shopland of Torquay. This bird is over 100 years old. Barn Owl by TE Gunn of Norwich. This bird is over 100 years old. Rough Legged Buzzards by Pratt of Brighton. Common Buzzards by Pratt of Brighton. Barn Owl and Tawny Owl by Hutchings of Aberystwyth. Victorian Case. Long Eared Owl and Tawny Owl by Hutchings. Woodcock and Grey Hen by Mark Ball. Mixed case of Brtish Birds. 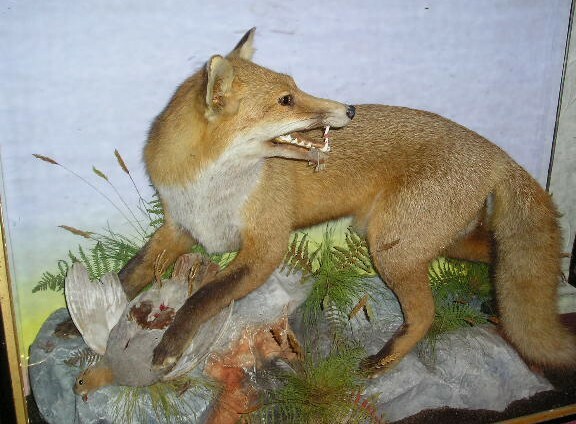 European Red Fox with Partridge prey by James Hutchings. 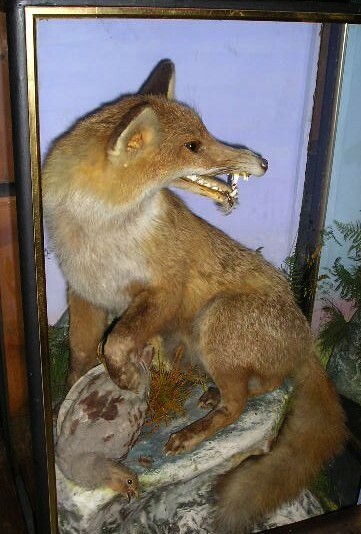 This fox however has the most unusual expression. Not like so many other Hutchings foxes seen. Red Legged Partridge by Shelbrook of Brignorth. Red Legged Partridge by Rowland Ward. 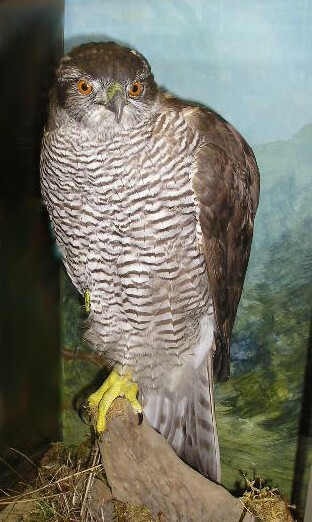 Female Sparrowhawk by Rowland Ward. Longtailed Duck by Mark Ball in the style of Peter Spicer. Victorian Ruffs by Bill Cook. European Red Fox with Grey Partridge prey by Hutchings. European Red Fox with Red Grouse prey by Hutchings. 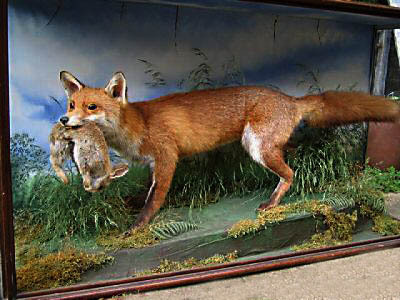 Victorian Fox chasing Rabbits by Murray of Carnforth. Victorian mixed case by Hutchings. 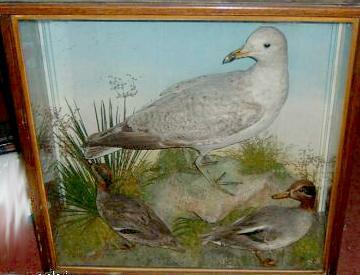 Victorian Herring Gulls by Hutchings. Victorian Kestrel and Pheasant by Hutchings. Victorian Common Buzzard by Bill Cox of Liverpool. 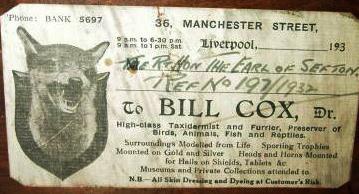 Victorian Curlew by Bill Cox of Liverpool. European Bull Finches, nest and chicks by TE Gunn. Victorian case. Spoonbills by TE Gunn. Victorian case. European Otter by TE Gunn. Victorian case. European Buzzard by TE Gunn. Victorian case. Great Crested Grebe by TE Gunn. Victorian case. European Badger with new born cubs by TE Gunn. Victorian case. Tawny Owl by TE Gunn. Victorian case. Modern case by Williams, containing a Mature Barn owl and young. Modern case by Williams, containing a Mountain Hare. Modern case by Williams, containing a Male and Female European Teal. Modern case by Williams, containing a Snowy Owl. John Cooper Peregrine in bow fronted case. 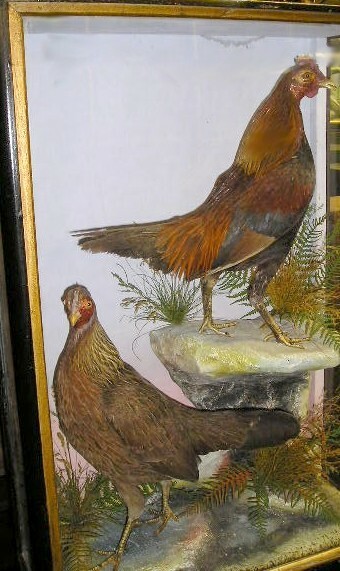 Cooper was better known for his fish taxidermy, but carried out very competent birds. Pair of Blackcaps and eggs A J Armitstead, December 2003. Song Thrushes by AJ Armitstead. Simply Stunning, in a pictureframe case. Hooded Mergansers by AJ Armitstead. Simply Stunning, in a pictureframe case. European Dipper by AJ Armitstead. Simply Stunning, in a pictureframe case. Chaffinches by AJ Armitstead. Simply Stunning, in a pictureframe case. North Atlantic Gannet by Kirk of Glasgow. Whimbrels at a water scene by either TE Gunn or Lowne. Ring Ouzel by Joseph Cullingford of Durham. Gsohawk by Mark Ball. Modern case. Golden Oriels by Hope of Edinburgh. Black Grouse by Rowland Ward. Wigeon and Tuffted duck by Hutchings. Red Squirrels by Lewis Hutton of Bristol. Mallards and ducklings from Clungunford Collection. Bittern by Lowne of Yarmouth. Great Crested Grebes by Lowne of Yarmouth. Bar Tailed Godwit by Saunders of Yarmouth. White Pheasant by Sheals of Dublin. Moorhens by Hutchings with slug prey. Black Throated Diver in Winter plumage by Shopland of Torquay. This is a Victorian case with a cliff scene watercolour background. Merganser by Pratt of Brighton. European Waxwings by TE Gunn. Victorian case. Pine Martin by Kirk of Glasgow. Domestic Duck, could be an India Runner by TE Gunn of Norwich. This bird is over 100 years old. 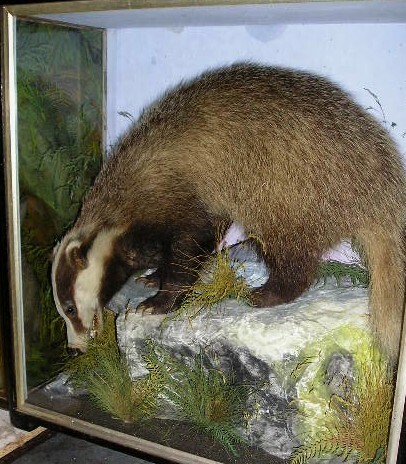 European Badger by Shelbrook of Brignorth, Shropshire. 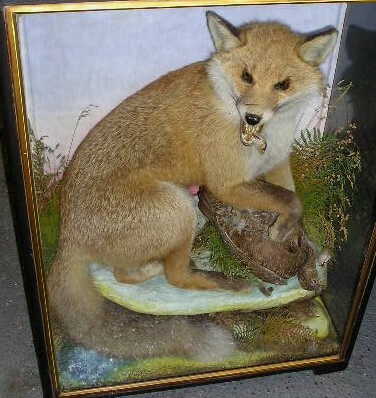 This Victorian taxidermied case is approximately 100 years old. 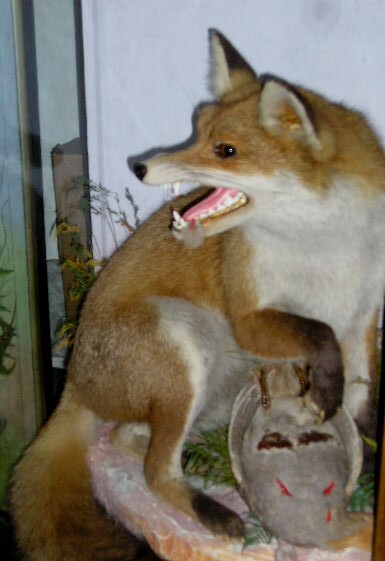 Close up of European Red Fox devouring a domestic Chickhen by Jefferies of Camarthen. 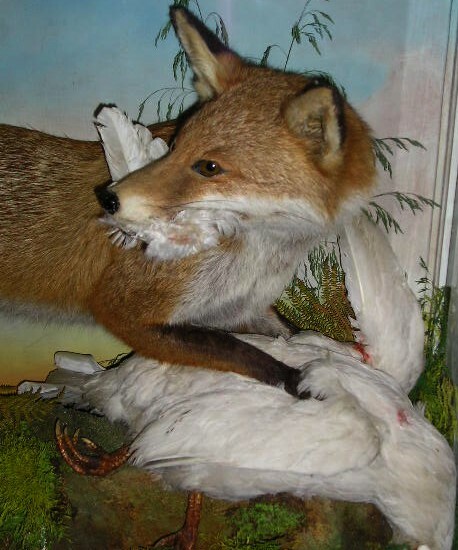 European Red Fox devouring a domestic Chickhen by Jefferies of Camarthen.